Der grösste Betrug der NATO, mit Pentagon Kriminellen, mit der Firma AEY, einer Firma als Radfahrer Shop, welche plötzlich Munition und Waffen Aufträge vom vollkommen korrupten Pentagon erhielt und dreiste Betrugs uralt Munition lieferte. Prominente Milliardäre, Jüdische Rabbis, waren die Paten des Geschäftes in den USA, für ihre Kinder und Verwandten. Der Pate des Verbrechens sitzt auch in Deutschland, wenn mit Vorsatz, dieser vorbestrafte Drogen Gangster, Betrüger trotzdem in Deutschland empfangen wird nach Jahren: Im prozess in den USA, beschuldigte die Tochter von Trebicka, einem zwielichtigen Geheimdienst nahen Albanischen Übersetzer, Shkelzen Berisha auch der Ermordung ihres Vaters. Das Pentagon ist die mit Abstand finanziell am besten ausgestattete Behörde der Welt. Laut einem Whistleblower betrachten manche Beamte, Generäle das US-Verteidigungsministerium als eine Art Selbstbedienungsladen, um Freunden und Verbündeten lukrative Aufträge zuzuschanzen. Diveroli was born on December 20, 1985, in Miami Beach, Florida, the son of Ateret and Michael Diveroli. The family was Orthodox Jewish, strictly observing all traditional Jewish laws. His grandfather, Yoav Botach, is one of the wealthiest property owners in Los Angeles, and his uncle is celebrity rabbi Shmuley Boteach. Das führt tief in die US Waffen Betrugs Lobby der Juden und Rabbi Mafia auch als Manager von Michel Jackson. 28 Tote, als das Muntions Umpack Lager in die Luft flog, weil die billigen Arbeiter dort auch noch rauchten und überall Munition am Boden verstreut war. Die Tätigkeit mit Geldwäsche Firmen in Zypern, eines Schweizers wird bis heute Tot geschwiegen. Kokalari: Was passiert mit Shkëlzen, nachdem er den Prozess in den USA verloren hat? In einem vor zwei Wochen in DITA veröffentlichten Interview sprach Geri Kokalari von einem Gerichtsverfahren, das Shkelzen Berisha in den USA eröffnet hatte. 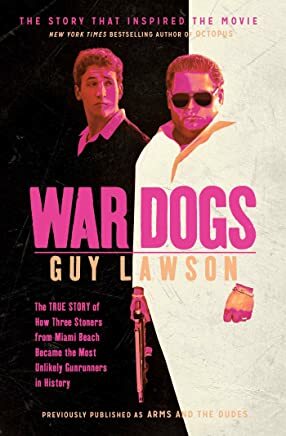 In diesen Tagen wies ein Gericht in Florida seine Ansprüche zurück und wies den Fall gegen den US-Autor Guy Lawson, den Autor des Buches für Gerdec, ab. – Herr Kokalari, wir haben erfahren, dass Shkëlzen Berisha den Prozess verpasst hat, den er in den USA für den Fall Gërdec eröffnet hatte, wo er nicht weniger forderte, sondern 60 Millionen Dollar forderte, um die beanspruchte Würde als benachteiligt zu betrachten. Wie würden Sie den Verlust von Shkëlzenit kommentieren? Kurz, klar, Shkëlzen war verloren, weil das Gericht befand, dass nichts auf seiner Klage basiert. Anders als in Albanien ziehen Gerichte in den USA Schlussfolgerungen, indem sie Fakten verwenden und nicht Auswirkungen. Die Entscheidung des Gerichts wirft andere Fragen auf, etwa ob das Gericht Shkëlzens Argumenten nicht glaubte. Sollten wir davon ausgehen, dass die Behauptungen in Lawsons Buch, dass Shkëlzen an AEY beteiligt war, zutreffen? Wenn ja, dann ist es vielleicht an der Zeit, eine Untersuchung einzuleiten, wer in Albanien für AEY verantwortlich war. Warum wurde nie der Frage nachgegangen, wer die Firma AEY, in Albanien vertrat, was der Gangster Farmir Mediu, Berisha, der damalige Generalstabschef ja deutlich sagte. Schäuble, Dr. Jung Der verantwortliche Verteidigungs Minister Fatmir Mediu, mit Luxus Auto: Heute unverändert angeklagt, aber wieder als vollkommen korrupte und auch sehr dumme Person, wieder Minister. Auch der entlassene General Stabs Chef, bezeugte vor Gericht, das Minister Fatmir Mediu, ein enger alter Freund von Salih Berisha, der Architekt dieser hoch kriminellen Konstruktionen ist. Diese kriminellen Konstruktionen bestanden aber schon durch die Amerikaner inklusive dem Drogen Handel im Jahre 2000 mindestens und mit Sicherheit auch davor. Schon im Jahre 1998, liefen Schiffe aus Durres aus, in Richtung USA, welche mit Waffen und Munition Container beladen waren. vor allem waren es Chinesische AK-47, Chinesische Munition, Granatwerfer und auch Raketen, welche in unglaublicher Zahl in Albanischen Munitions Depots lagerten. 2 Anwälte der Opfer, haben nun vor dem EU Menschenrechtshof erreicht, das Fatmir Mediu, persönlich haftend ist. Fatmir Mediu, arbeitet nun mit der Müll Mafia der Camorra der Italienischen Mafia. Mihal Delijorgjit (in Haft im Moment)und sein Villa natürlich auch dort und die vom Verteidigungs Minister Fatmir Mediu sowieso (die Mafia hat ihm wohl das Grundstück geschenckt. Die Verantwortlichen der Kathastrophe von Gerdec, sind also auch dort, was sowieso klar war. Speculation Surrounds Case of Albanian Whistle-Blower Kosta Trebicka’s Death, Miami Arms Dealer Efraim Diveroli and links to the Albanian Mafia ! Oct. 8th 2008, The investigation into the death of a whistle-blower Kosta Trebicka in Albania appears to be nearing its conclusion, but with little hope of quelling the suspicion and speculation surrounding the case. 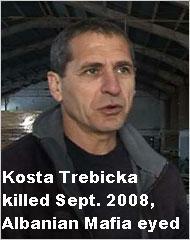 Kosta Trebicka, a witness in an inquiry, died (possibly murdered) last month, 9/12/2008. The whistle-blower, Kosta Trebicka, uncovered evidence of public corruption in the export of ammunition from the Communist era in Albania . His accusations were followed by arrests in Albania and charges against the employees of an arms-dealing company (AEY Inc) in Miami Fl, United States, but only after an explosion at a munitions facility in the town of Gerdeci Albania killed 26 people, including children. Mr. Trebicka, 48, a witness in the investigation into the explosion, a national tragedy in Albania, was found dead on a rural roadside near his car (see video click here). According to „News 24 TV“ Albania , Trebicka was linked with the American intelligence service CIA about the investigation of trafficking weapons by the Albanian army and Albanian mafia and he was the top person who knew everything about the Gerdeci Blast scandal of Albania last March 2008. Albania’s government said on Friday Sept 12 2008 it was looking into the sudden death of an arms industry figure who was helping prosecutors investigate a weapons sale to the United States and an explosion that killed 26 people. Television pictures (see video click here) showed businessman Kosta Trebicka, his head covered in blood, sprawled on his back on a dirt road in a remote area of eastern Albania, where he had been hunting. His off-road car was nearby, and appeared to be damaged. 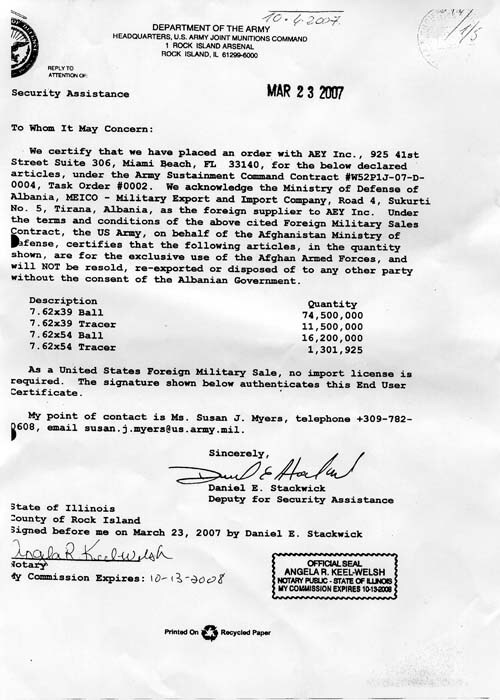 Trebicka was involved in repackaging ageing Chinese ammunition that was being sold from Albania to AEY Inc (Efraim Diveroli), a U.S. firm contracted by the Pentagon to supply the Afghan army. Transcript of Diveroli – Trebicka Conversation, between Efraim Diveroli in Miami Fl and Kosta Trebicka in Albania – alleging Prime Minister Son, Mr. Shkelzen Berisha, on weapons smuggling from Albania and heavy influence of Albanian Mafia on Prime Minister, Sali Berisha’s Deals. Recorded in Tirana, Albania on June 11, 2007 at 20:49 PM by Trebicka, Diveroli was in Florida* This conversation was recorded in Albania by Kosta Trebicka on a Nokia cell phone, the high quality and clarity of the (recorded) conversation indicates that Kosta Trebicka had professional assistance (CIA) in recording the conversation on his cell phone. 1). 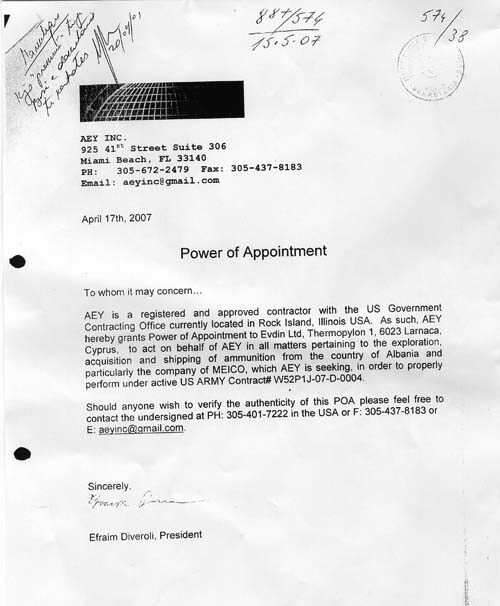 Efraim Diveroli – President of Miami- based AEY, Inc.
“MEICO”( Military Export Import Company ) is a public enterprise subordinate by the Albanian Ministry of Defense. “For the creation of Import- Export Enterprise subordinate by the Ministry of Defense”. “MEICO” is made up of a specialized staff (Albanian Mafia) in the field of import- exports. Its General Director is Mr. Ylli Pinari. It is alleged the Albanian military and AEY Miami Fl used a third company, Cyprus-based Evdin Ltd., a company subcontracted by Albania’s trading giant, MEICO, to coordinate the deal between the Albanian military and AEY In Miami Fl. The New York Times alleges the Head of MEICO, Ylli Pinari, doubled the real price of the munitions and pocketed the difference which was shared among Albanian politicians. Efraim Diveroli, AYE’s chief, David Packouz, Alexander Podrizki and Ralph Merrill were indicted by a federal grand jury in Miami on wide-ranging fraud charges in connection to supplying faulty ammunition to the Afghan army. 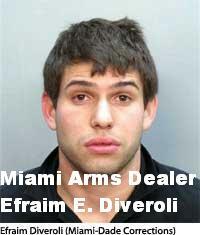 The head of Miami-based company AEY Efraim Diveroli, suspected of a murky arms deals with Albanian officials to ship Chinese-made ammunition to the Afghan army is expected to plead guilty. “The 22-year-old arms dealer will plead guilty to charges that he defrauded the U.S. government by shipping Chinese-made ammunition to Afghanistan and then trying to hide its country of origin from military officials,” the Associated Press reports. Efraim Diveroli, AYE’s chief in Miami, David Packouz, Alexander Podrizki and Ralph Merrill were indicted by a federal grand jury in Miami on wide-ranging fraud charges, see Efraim Diveroli’s Florida State charges below. Trebicka: What’s happening with your pal Pinari? Diveroli: I don’t know, you tell me, did you make a deal with him with the boxes?Trebicka: I don’t want to make a deal with him, you know that he is a crook, you told me before that he’s a mafia guy, didn’t you? Diveroli: I think he is, either he’s the (Albanina) mafia or the (Albanina) mafia is controlling him. Either way he’s a problem. The problem is, I don’t have a choice. I have to deal with him. The U.S. government is expecting the products. I have no decision to make. Trebicka: Which one is the company, is it still Delijorgji? Diverolli: I have no fxxking idea, we’re waiting for Pinari to give us the details of this company. I will push this sale very hard to go through. Diveroli: ………. (Some talk about services Trebicka is still supposed to do for Diveroli.) I’ve been 100% with you. I did not remove you from this job. You understand that? I have nothing to do with this. Even though Pinari asked me to, and he’s forcing me to, I have never supported this decision. I’m very, very upset, I’m very concerned. Trebicka: Is he still working with Henry Thomet? Diveroli: I think he’s still working with Henry. I’m still working with Henry. I have to work with Henry. I’m working with Henry. Diveroli: …I’m different than Henry, I can’t play monkey business with the (Albanina) mafia and Delijorgji and all those fxxking guys in Albania….. I’m a U.S. company, I’m working for the government, everyone is watching me. Pinari needs a guy like Henry in the middle to take care of him and his buddies (Albanian Mafia), which is none of my business. I don’t want to know about that business, I want to know about legitimate businesses. That’s my feeling, that’s my feeling on the situation, that’s my idea, that’s my opinion. Trebicka: ….but I think with Pinari and his (Albanian) mafia guys and Delijorgji and Henry, it will be difficult for you to go ahead because they will create lots of problems …. Probably I will be invited in Washington DC from the CIA guys and from my friends over there. .. two weeks from now I will come to Florida to shake hands with you and discuss future deals. Diveroli: I like that. Let’s do that. Diveroli: I have a good deal going on in Serbia right now that I might need some financing for…. Kosta, Kosta, I have an idea, maybe, you could finish packing, for example, the two and half million you owe me. And Pinari and Delijorgji will see your operation is already moving smoothly and they’re not going to want to disrupt it, so they’ll buy the material from you. They don’t have to go around and drive to Macedonia and schlep around. Maybe this is a good idea, I think. Do you think Pinari is actually going to do the job? Trebicka: I found good partners and I think I can continue the job. I don’t know about Pinari, Delijorgji and his (Albanina ) mafia…if they want to still work with me… I will not talk, I will not open mouth, I will do whatever you tell me to do. Diveroli: I understand…. I’m just telling you… I protect you, you protect me type of thing. Let me speak with Pinari. Pinari knows he has to do the packaging. See Prior Post on Albanian Mafia,Monday, August 25, 2008, ALBANIAN MUSLIM MAFIA RUNS INTL STOLEN CAR RING TO FUND JIHAD, UPDATED BY PRIVATE INVESTIGATOR BILL WARNER. US Militär Ausbildung für Kosovo Kriminelle, geht mindestens auf 1994 zurück, direkt durch Wesley Clark in den USA. US Militär Ausbilder gab es schon in 1996 in Albanien und die Erprobung der Pedrator Drohnen vom CIA mit der dortigen Schmuggler Mafia nördlich von Vlore gab es schon in 1995 Seit 20 Jahren von US Kriminellen des Pentagon, des US Department of State versprochen, die Kosovo Armee und Alles andere ist Betrugs Show der EU und von Berlin, was mit Joschka Fischer schon begann. Direkt von Berufs Kriminellen, wie Yassin Kadi, Bin Laden, Abdul Latif Saleh, Frank Walter Steinmeier und dem Berufsbetrüger der USA: Frank Wisner jun. mit uralter CIA Legende gegründet.